The melody Moufu Kuang Jun, found only in Xilutang Qintong,5 is connected to a theme common in Confucian literature: an advisor must tell his lord to act properly. If the good advice is taken, the lord will succeed; if the good advice is not taken, the lord will fail. The advisor in the present case, Moufu, the Duke of Zhai,6 is recorded to have advised King Mu of Zhou (r. ca. 956-918)7 both how to treat his subjects and how to deal with neighboring countries. The connection with the poem Qizhao Shi suggests that this melody concerns how to treat subjects. In addition to being an alternate title, Qizhao Shi forms the lyrics that begin each of the nine sections of Moufu Kuang Jun. In this way the structure of the melody is similar to that of melody #28 Yanyi Ge, which also repeats a short set of lyrics at the beginning of each section. The present lyrics are quoted in the Zuo Zhuan8 as part of a later story. Here King Ling of Chu (r. 541-529),9 who has been aggressive towards his neighbors and neglectful of his proper duties, does not heed advice from his retainer, Zige. Zige then relates to King Ling the story of Moufu admonishing King Mu, quoting the poem Qizhao Shi. Although King Ling then tries to follow this advice, he is unable to do so. As a result he loses his throne. The original admonition by Moufu, as told in the Annals of History,10 is quite lengthy. King Mu was about to attack a tribal group some distance from home. Moufu, quoting not the Qizhao Shi but some lines (later) included in the Book of Poetry,11 says that although a king might attack a near neighbor who offends him, he should be much more careful about venturing so far afield as this. The result of King Mu not taking the advice is related in Annal 5 of the Annals of History.12 Here it says that King Mu, who had become very fond of a certain Zao Fu because of his skill as a good driver, took a chariot with eight (or four) horses and went on an extended tour of the West, with no thought of returning home. King Yan of Xu13 took advantage of this to revolt, and so King Mu had to rush home to quell the rebellion. My reconstruction is incomplete, and there are no available recordings. King Mu of Zhou rode on an eight horse (chariot) as he rambled all over. Moufu Duke of Zhai admonished the king, and because of this urging (the king) became aware of the truth. At (another) time King Yan of Xu often moved about the Zhou throne (?). As a result the philosopher Zhu Xi said, "If it weren't for the Qizhao Shi the Xu region manage imperial extreme." This melody is old and elegant; those who understand it should get it for themselves. (Moufu's) good advice is very solemn, appropriate to virtue and fame. It considers (the accuracy of) our king's measures and movements, to be as valuable as his gems or gold. His regulations should be appropriate to the people's capabilities, and he should not have the heart of a drunkard or glutton. 6557.0/#6 謀父 says 姓也 surname; no mention of music. Moufu Kuang Jun is the 94th piece in 西麓堂琴統 Xilutang Qintong, compiled by 汪芝 Wang Zhi. 25205.13 祈招 Qizhao says it is the name of a 詩 shi; no mention of music. Watson (see below) says Qi Zhao is one of the lost odes, and there is disagreement about how to translate the title. Suggestions include Seeking Brightness, and Seeking Return as well as Ode of Good Advice. The text together with transliteration and my translation are given below. Others are mentioned below. The original text can be found online at the CTP. This image of Section 4 shows corrections made in the text. Such corrections are unusual in this handbook. Nevertheless, a number of mistakes still remain. Zha Guide 21/189/375 lists only this one occurrence. 謀父祭公 Moufu Duke of Zhai (or Ji) is mentioned in several early sources. The "fu" in Moufu literally means "father". It could also mean "old man", but at that time it seems to have been commonly found as a suffix to a name. King Mu (r. 956-918), mentioned here in both Annal 4 (ref) and Annal 5 (ref), is also mentioned in several other early sources. The lyrics here actually change two characters in the first line, replacing 式昭 with 昭尔. The Zuo Zhuan version is translated in Burton Watson, The Tso Chuan, NY, Columbia U. Press, 1989. pp.166-167. Legge's is on p. 640 of V. The Ch'un Ts'ew. Traditionally the 左傳 Zuo Zhuan was considered to be a commentary on the 春秋 Spring and Autumn Annals. His advisor is 子革 Zige. In Annal 4; see Nienhauser, Vol. I. p.67. The reference for the other story is below. In Annal 5 (Nienhauser, Vol. I, p.88). 造父 Zao Fu is said later to have been an ancestor of 秦 Qin. Nienhauser, I, p. 88 fn 25 says Yan lived in the early 7th century BCE. 3/981 徐偃王 Xu Yan Wang quotes stories from 荀子 Xunzi (非相 Feixiang 5.5), 韓非子 Han Feizi (五蠹 Wudu), Shiji and elsewhere. The stories don't agree, but generally tell of a virtuous ruler who was not strong enough ("Yan" means cease or desist). See also 3/397 徐方, which also quotes this poem. In ancient times King Wen lived in the area between Feng and Hao, his domain no more than a hundred li square, but he practiced benevolence and righteousness, won over the Western Barbarians, and eventually became ruler of the word. King Yan of Xu lived east of the Han River in a territory five hundred li square. He practiced benevolence and righteousness, and thirty-six states came with gifts of territory to pay him tribute, until King Wen of Jing, fearing for his own safety, called out his troops, attacked Xu, and wiped it out. Thus King Wen practiced benevolence and righteousness and became ruler of the world, but King Yan practiced benevolence and righteousness and destroyed his state. This is because benevolence and righteousness served for ancient times, but no longer serve today. So I say that circumstances differ with the age. N.B. King Yan lived after King Wen! 16. Why not make corrections? 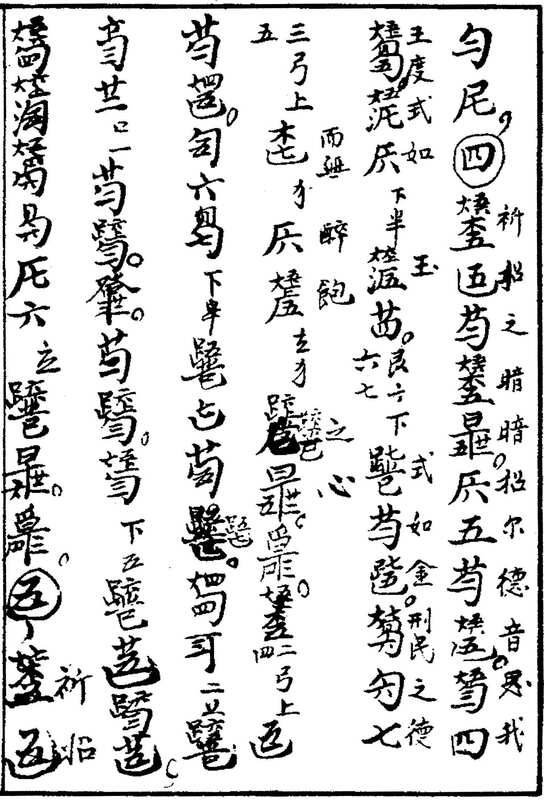 The original says, "此篇音調古雅，識者當自得之." Zhu Quan may have expressed a similar reticense in Shen Qi Mi Pu. Translation is so far tentative. Qí zhāo zhī yīn yīn, shì zhāo dé yīn. Sī wǒ wáng dù, shì rú yù, shì rú jīn. Xíng mín zhī lì, ér wú zuì bǎo zhī xīn. His regulations should be appropriate to the people's capabilities, and he should not have the heart of a drunkard or glutton. See also another translation.